Abstract: In the October column, Kerry Hennigan talks about the role of advocacy as part of the Michael Jackson fan phenomenon. Hennigan, Kerry. 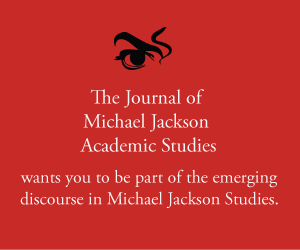 “MJ Studies Today X (14-10-16).” The Journal of Michael Jackson Academic Studies 3, no. 2 (2016). http://michaeljacksonstudies.org/mjstudiesx/. When another smear campaign against Michael Jackson raised its ugly head in the media recently, it prompted me (again!) to think about the role of advocacy as part of the Michael Jackson fan phenomenon. Given the accusations made against Michael throughout his adult career, the criminal court case in 2005 and the many times his art and personal integrity have been impugned, fans have become accustomed to rallying to his defence. Michael Jackson actually referred to his fans as his ‘soldiers of love’ – a mantle taken quite seriously by many of us. That the need for advocacy has continued beyond Michael’s lifetime is a sad indictment of our times, particularly in relation to the role the media plays in manipulating public opinion. The problem for fans is how to combat the falsehoods without spreading them further afield. My early engagement with the Michael Jackson fan phenomenon included contributing items of interest to a website based in the Netherlands. I quickly learned there were some direct links that I should not share. I could write a synopsis of what was happening to alert fellow fans to the situation; I could even suggest a course of action to counter the errors or falsehoods, whether it be sending emails or signing and distributing petitions. However, I was never to post links that directed traffic to the source of any dubious story. If we do choose to counteract inflammatory stories or comments, most experienced campaigners are aware that the way fans leap to the defence of their idol is important if we want the uninformed to listen to what we have to say and learn from it. My personal opinion is that if we truly consider ourselves to be Michael’s ‘soldiers of love’ we need to be conscious of how we express ourselves to the world in that role. Combating ignorance with insults, whether verbal or written, is a form of violence and just compounds the problem. If we have thrown a metaphorical brick through someone’s window (as tempting as it may be!) they are unlikely to take us seriously, and they are probably not going to feel encouraged to address their reporting inadequacies, which would be the desired outcome. There is another reason for being mindful of avoiding such actions: Michael Jackson suffered name-calling, bullying and worse condemnation during his lifetime. Posthumously he remains a target for this type of activity (as are his children – a truly shameful situation). Ideally, we should learn from their experience and find better tools to express our feelings on Michael’s behalf. Sometimes a simple social media post or tweet with a photograph of Michael or a web link to one of his short films or songs better expresses our feelings when the appropriate words fail us. I thought I knew what she meant, and that I was prepared. Statement of June 21, 2016 as published by Billboard. www.dailymichael.com; http://allforloveblog.com/; http://defendingmichaelslegacy.blogspot.com.au/p/adllaw-initiative.html and numerous others.